﻿﻿Marine Science at SeaWorld (MSSW) covers topics appropriate for grade level with instruction and hands-on lab activities during each class. Students will also participate in marine-oriented field trips and semester projects. Students have a reading assignment and chapter tests from The Ocean Book (provided by Science Partners) to complete before each class. All science is taught from a creationist, Christian, Biblical worldview while making students aware of other worldviews. The objective is to teach students to see the Hand of the Creator in all of nature. Successful completion of high school biology is a prerequisite. Each student needs a SeaWorld annual pass that is good through the end of the school year. Minimum number for each class is eight students. For the 2018-19 school year, orientation is on Monday, August 13, at 7:00 PM at WaterStone Church in Longwood. During the school year, there are eight MSSW classes that meet once a month on a Friday from 9:45 AM - 2:00 PM (six at SeaWorld and two at WaterStone Church in Longwood), two all-day Friday field trips (one per semester), and two Monday evening project presentations (one per semester). These 12 dates must be a priority! PLEASE DO NOT ENROLL IF YOU HAVE ANY CONFLICTS including sports, drama, speech, debate, family vacations, church youth group, competitions, etc. CLASS TOPICS include Introduction to Marine Science, Osteichthyes (bony fish), Chondrichthyes (cartilaginous fish), Pinnipeds (seals, sea lions, and walruses), Marine Invertebrates, Sirenians (manatees), Marine Animal Behavior, Aves (birds with focus on waterfowl), Marine Reptiles (sea turtles), Florida's Marine Habitats, Cetaceans (whales and dolphins), Arctic and Antarctic Ecosystems, and Animal Husbandry. GRADES / CREDIT - This class meets Florida Department of Education's Next Generation Sunshine State Standards for Marine Science 1 with Lab - 2002500. With extra assignments, Marine Science Honors 1 with Lab - 2002510 may be earned. Science Partners is an approved educational provider for Circle Christian School, Orlando.﻿﻿﻿ Science Partners cannot issue credit, but will return graded homework and project assignments and issue a grade sheet on a monthly basis. Grades are based on homework assignments, classwork, and semester projects (project, written report, and oral presentation). Parents are responsible for applying for credit from their county or umbrella/private school covering. CURRICULUM - Mr. and Mrs. Clifton have developed the curriculum for this class. They are authors, science educators, creationists, and Florida Master Naturalists. Mr. Clifton has taught science for almost 40 years and was head of the Education Department at SeaWorld Orlando for seven years. Students use The Ocean Book (provided by Science Partners) and many other supplemental handouts as they study marine science from a creationist perspective. For more information on this book, go to www.masterbooks.net and search for The Ocean Book. HOMEWORK assignments may include, but are not limited to, completing lab activities begun in class, additional handouts, monthly reading assignment in The Ocean Book, monthly tests on class discussion and reading assignment, and semester projects (written report, project, and oral presentation). Good writing skills are essential for this class. SEMESTER FIELD TRIPS - Parents are needed to drive multiple students and chaperone trips. All entrance fees for marine science students and parents who drive multiple students will be covered. Parents may also attend and drive just their own student. In that case, the parent pays his or her own snorkeling or airboat fee. Details will be announced. Semester 1 Field Trip – Friday, November 9, 2018: On this class/field trip, we will Snorkel with Manatees. Our topic is Sirenians (manatees). We will carpool to the dive shop in Crystal River, take pontoon boats out in search of manatees, and then get into the water equipped with wetsuits, snorkel, mask, and fins. After our snorkel time, we will have a picnic lunch and then class time studying manatees. Class hours for this field trip are 6:00 AM – 3:00 PM. Semester 2 Field Trip – Friday, March 8, 2019: On this class/field trip, we will focus on Florida's Marine Habitats. During the day, we will explore Merritt Island National Wildlife Refuge, Canaveral National Seashore, Indian River Lagoon, and the St. Johns River, comparing and contrasting Florida’s salt, brackish, and fresh water ecosystems. The day will include lab activities, beach cleanup, water sampling, seining, and an airboat ride. Class hours for this field trip are 7:45 AM - 4:00 PM. SEMESTER PROJECTS- Students will be assigned a project each semester. Each project also includes a written report and an oral presentation. Projects will be presented to families, friends, and peers at WaterStone Church in Longwood. Semester 1 Project Presentations – Top Marine Predator Mobile: Monday evening, November 26, 2018, at 7:00 PM. Semester 2 Project Presentations – Instructional Product / Teaching Tool: Monday evening, April 29, 2019, at 7:00 PM. For registration to be complete, you must turn in your registration form, registration fee, and family agreement signed by student and one parent. Registration fee for MSSW is $150 for a single student or $125 each for two or more students enrolling from the same family. 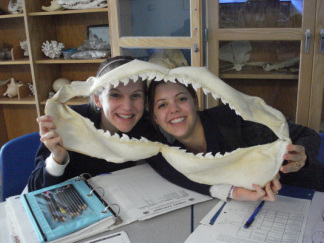 Fee covers use of textbook, handouts, lab equipment, supplies, presentations, field trips, and activities at SeaWorld. Tuition for high school classes is $85 per month or $850 per year per student. You may save $25 by making a single payment of $825 by the first class. Tuition for MSSW is due on each class date, August through May, and late one week after class with a $5 per student late fee. Please make checks payable to Science Partners. Tuition may be turned in during class or mailed to Science Partners, 343 Allison Avenue, Longwood, FL 32750. Name Badge: provided by Science Partners. Must be worn to every class and field trip unless otherwise instructed. SeaWorld annual pass that is good through the end of the school year. ﻿﻿Backpack﻿﻿. SeaWorld security may search backpacks before we enter the park. Twelve dividers: Ten class dividers labeled 1-10 or Aug-May, plus two dividers labeled Sem. 1 Project and Sem. 2 Project. Lunch / snack and drink / water. Students need to bring lunch / snack and drink / water for our short break. We have a full agenda and do NOT have time to wait in line to purchase food and drinks. There are water fountains at SeaWorld but you may want to bring extra water. It can be very hot, especially in September and May. Rain poncho. Rain showers occur often in Florida. Uniform. See Dress Code information. E-mail account. Much of our communication is by email. Student and / or parent must have an active email account and check it often, especially the day before class. The Ocean Book: provided by Science Partners. The book is not used during class time and should be left at home. Optional items: Camera to record material for your projects, hat, sunglasses, sunscreen. Questions? Contact Bill or Merilee Clifton at 407-808-4458 (cell/text) or sciencepartners@cfl.rr.com.